My most recent painting, titled "Market Baskets" was just finished yesterday. This piece was done on 140 pound Arches watercolor paper with my layering technique (see previous entries to learn my technique). 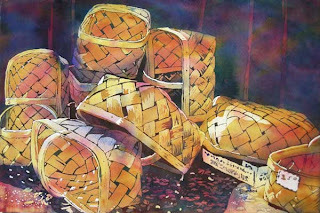 I saw these baskets at a fruit market one day when my friend Barbara and I were plein aire painting in Eau Gallie, Florida. When I saw the light glittering through the baskets, half in shadow, half in sunlight, I just knew they would make a great painting. I ran over with my camera and shot some reference photos right away. I could hardly wait to start working on drawings. Here is the result of the work. Preciosas cestas ,luces y sombras maravillosas ,enhorabuena.Un saludo.